December 4, 2018 By Elizabeth Lindemann 2 Comments / This post may contain affiliate links. 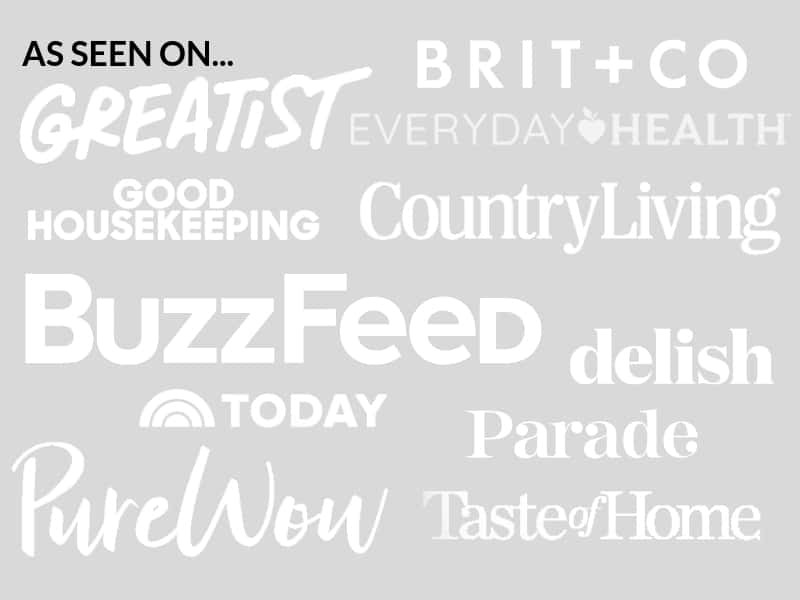 This post is sponsored by Reames® and SheKnows Media. All opinions are my own. 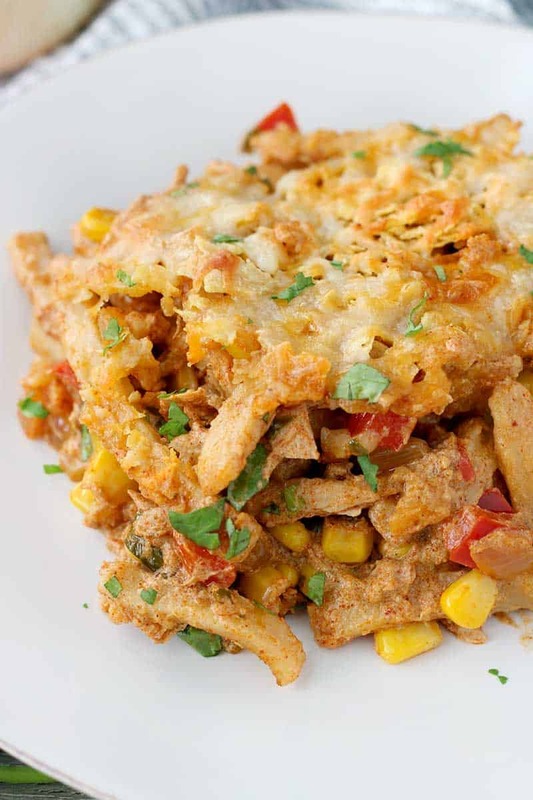 Tuna casserole is one of my favorite comfort foods, and I love to do a Tex-Mex twist on an American classic. 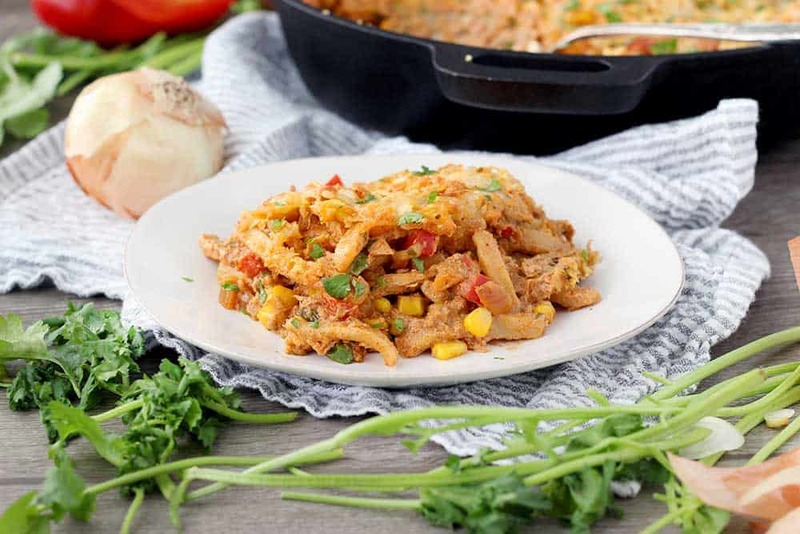 This Tex Mex Tuna Noodle Casserole is bursting with flavor, packed with veggies, and can be made in a skillet so you use fewer dishes. 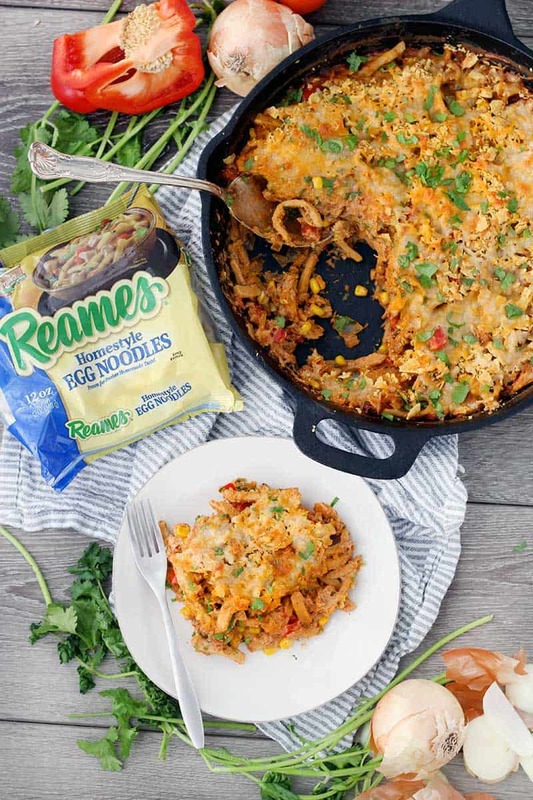 Using Reames Frozen Egg Noodles takes it over the top! To be honest, before making this casserole, I never knew that fresh frozen egg noodles existed. Once I discovered that I could get a homemade taste without any hassle, my world turned upside down. I used Reames Frozen Egg Noodles from the freezer section of my grocery store, and I may never go back to dry egg noodles from the aisle again. Reames Frozen Egg Noodles are completely different than your average egg noodle. They’re thick and the texture is the perfect level of chewy. Since they’re so hearty, they’re filling as well so you can have them as your main meal. These qualities plus the seriously homemade taste have me hooked! There’s just something special about a good casserole in the cold months. It’s no surprise that the midwest is famous for their casseroles, or “hot dishes,” since it gets so cold there. Another one of my favorite recipes to use Reames Frozen Egg Noodles in is this Homemade Chicken and Noodles recipe. 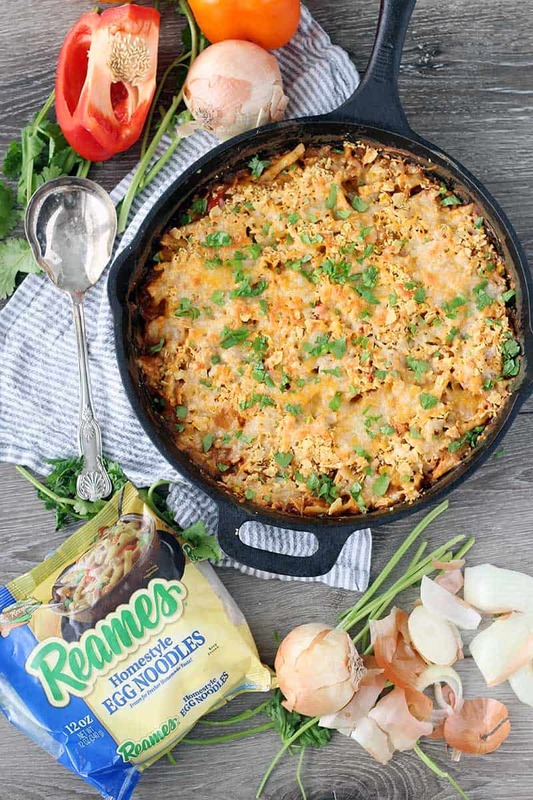 I just love this Tex Mex Tuna Noodle Casserole for so many reasons. First, it’s made in a skillet. What does that mean? Well, it means FEWER DISHES! You sauté all the veggies and mix up the casserole directly in a cast iron skillet, then bake it in the skillet in the oven to finish it off. You can use another oven-safe skillet as an alternative, like stainless steel, and if you don’t have an oven-safe skillet of any sort, no worries. You can do this the traditional way and transfer the casserole to a buttered baking dish to cook it. It’s also easy to make this casserole in advance. To do this, I do recommend transferring it to a baking dish, since you’ll need to refrigerate it and the skillet will be too hot to put in your fridge. You can even freeze it assembled, ready to bake, or freeze the leftovers for an easy second meal. Most tuna casserole recipes you find on the internet use a can of condensed cream of mushroom soup as the base. I prefer my casseroles to be more homemade. This Tex Mex Tuna Noodle Casserole uses a base of chicken broth and sour cream, creating a creamy, comforting consistency that sticks with the Tex Mex theme, without the need for canned soups. And the use of taco seasoning helps flavor the whole thing, without the need to add any extra salt and pepper to taste. Which means you don’t even need to think about it! I bought the exact amount of taco seasoning I needed from the bulk spices section of my grocery store. For $0.27. TWENTY SEVEN CENTS. I just love bulk spices. You can use store bought taco seasoning or you can easily make your own. The other fun twist on this recipe: I used crushed tortilla chips instead of bread crumbs for the topping. They added a toasty corn-flavored crunch that was perfect. If you don’t have any tortilla chips handy, you can definitely use bread crumbs, or even omit them entirely and just top with cheese. 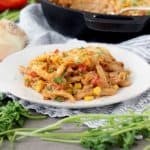 If you like this Tex Mex Tuna Noodle Casserole recipe, you’ll love these Tex Mex Tuna Melts, this Easy Chicken and Dumplings from Scratch, and this Easy Classic Shrimp and Grits. 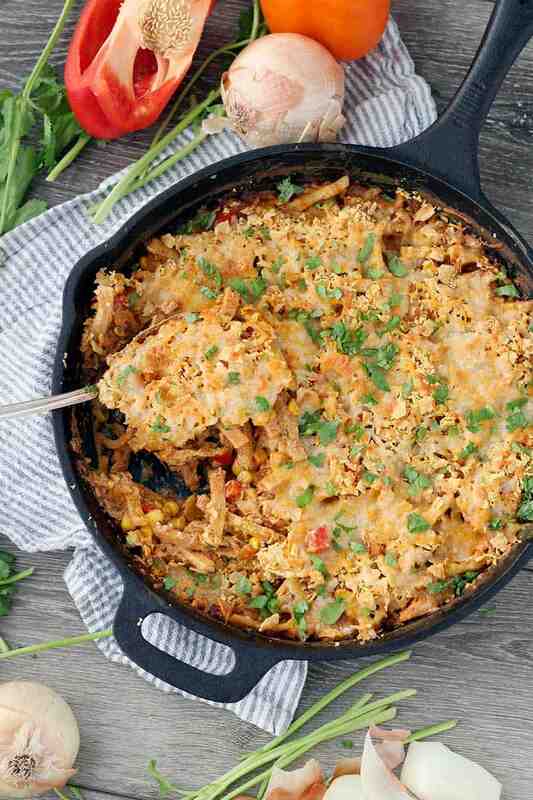 This Tex-Mex Tuna Noodle Casserole is bursting with flavor, packed with veggies, and can be made in a skillet so you use fewer dishes. 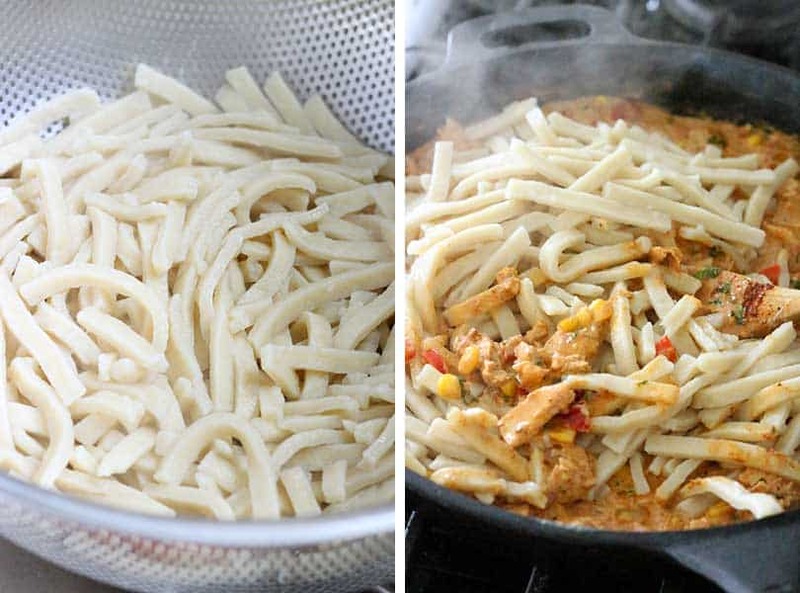 Using Reames Frozen Egg Noodles makes this recipe taste homemade without all of the work! Preheat oven to 425 degrees F and cook the frozen egg noodles according to directions in a medium sized pot. Meanwhile, heat butter in a 12-inch cast iron or other oven-safe skillet over medium-high heat. 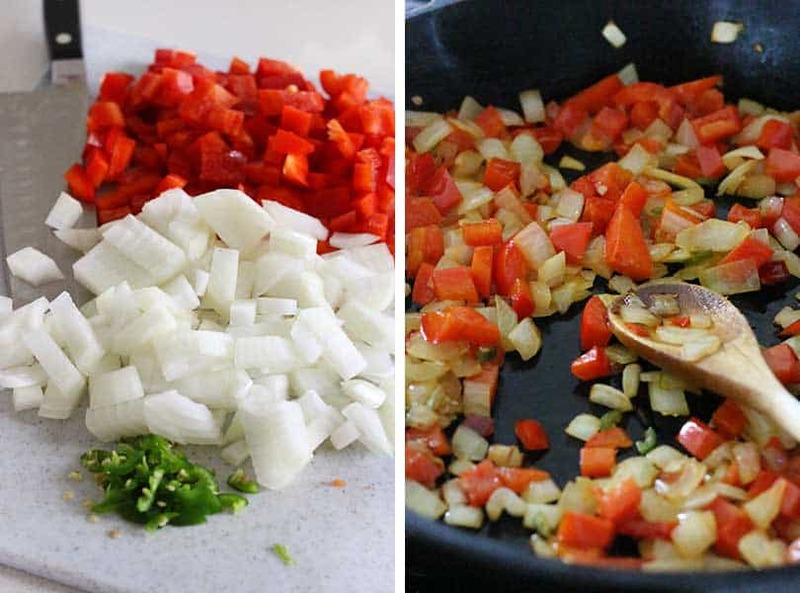 Sauté the onions, bell pepper, and jalapeño in the butter until softened and beginning to brown, stirring occasionally (about 5 minutes). Add the taco seasoning. Stir to coat the veggies and continue sautéing, stirring constantly, for about 30 seconds. Add the chicken broth. Use a wooden spoon to make sure any stuck-on bits are scraped up from the bottom of the skillet. Turn the heat to medium-low. Stir in the sour cream. Add the corn, tuna, cooked egg noodles, and cilantro. Stir well to incorporate and turn off the heat. Sprinkle the crushed tortilla chips on top of the casserole, followed by the cheese. Bake uncovered at 425 degrees for 15-20 minutes, or until chips are toasted and cheese is melted and beginning to brown. If you want to make this in advance, or if you don't have an oven-proof skillet you can use a casserole dish instead. After you've stirred the tuna, corn, noodles, and cilantro into the skillet, transfer the casserole to a buttered baking dish. Then, top with crushed chips and cheese and bake. If you've made it in advance and the casserole has cooled off from being in your fridge, bake covered with foil for 20 minutes, then remove the foil and bake for another 15 minutes or so, until fully heated through and cheese is melted and beginning to brown. You can also freeze the assembled casserole covered tightly for up to three months. Just defrost completely when you want to cook it. Best tuna noodle casserole ever! Thanks for turning us on to frozen noodles! Gonna try it with our instant pot garlic chicken in place of tuna next time.